Asbestos was a common construction material into the 1980s. Asbestos has been used in our society for thousands of years and has been used in a number of building materials, both residential and commercial. Whether you need to abate the asbestos containing material (ACM) or manage the ACM in place, BEC can help you design a plan that is cost efficient, requires high safety standards, is compliant with local, state, and federal rules and regulations, and can be quickly implemented. Our professional staff and partners use a multi-disciplined approach to combating asbestos issues on buildings. Our basic survey helps you identify materials, plot their locations, quantify amounts, qualify types, and design a plan to reduce or eliminate the identified asbestos. Our understanding of the complex asbestos regulations, many years of experience, and close professional working relationship with state regulators help insure that we can mitigate the liabilities associated with asbestos. Over the years, BEC has provided asbestos inspection and design services in industrial structures, commercial buildings, public housing facilities, schools, military installations and historic structures. BEC we will see that all materials are tested, mapped, and properly defined then reported in a usable and understandable format. Asbestos Inspections - We will sample all of the suspect materials in your building(s), assess their conditions and quantifying them. Our drawings will accurately illustrate the locations where ACM was identified, condition of the sample, and classification of the material. Our report will provide options on how to handle the materials and provide you with a rough cost estimate for any recommended management or abatement. Asbestos Abatement Design Services - If you plan to renovate or demolish your building and asbestos is present then a plan for controlling the asbestos must be developed. Our abatement design services will identify and define the materials needing special handling and how to manage them during construction. Our design services can save you thousands by creating a basis for competitive bidding and eliminating construction change orders. Asbestos Construction Observation and Air Monitoring Services - Construction monitoring and air sampling records are important legal documents illustrating your responsible actions and protecting you from future liability. We will observe and document compliance with relevant regulations and standards and note the protective measures taken to isolate the work area from the occupants. Asbestos Operations and Maintenance (O&M) Plans - The majority of asbestos containing materials may not need to be removed from your building if you know how to properly manage it in place. Baker Environmental Consulting’s O&M plans will tell you: where the asbestos is, how you should monitor it, how to safely handle it, how to label it, how to train your employees working in the building, how to keep from disturbing the asbestos, and what to do if the asbestos is disturbed. 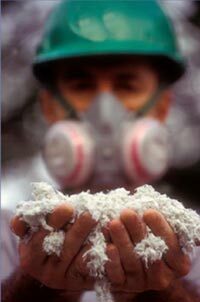 Asbestos Awareness Training - If you have asbestos in your building then you MUST give your employees proper training. OSHA regulations require your maintenance and janitorial workers to take a two (2) hour asbestos awareness class. BEC can provide you with this training. Classes are taught by experienced and energetic professionals who use your structure and O&M plan as the primary learning for the class. In addition, basic safe work practices are covered. Our training can help workers understand and accept the hazards of working in close proximity to asbestos. In 1978, the National Emission Standards for Hazardous Air Pollutant Standards (NESHAPS) under EPA guidance outlawed the installation of all friable asbestos (able to be crumbled by hand pressure). Non-friable asbestos containing materials such as floor tile and mastic were installed in buildings up until the early 1980’s and even later in some renovations. If a contractor had stockpiles of non-friable asbestos, they were within their legal rights to install it in buildings until their supplies were exhausted. Therefore, the only definitive answer for knowing if you have asbestos in your building is to obtain a letter from the building contractor testifying that the building was constructed or renovated with no Asbestos Containing Materials (ACM). Without this documentation, your only alternative is to have the building surveyed for ACM. Who Must Have Their Buildings Surveyed for Asbestos? If you own a building constructed or significantly modified prior to 1990, it may contain asbestos. The OSHA regulation 29 CFR 1910.1101 requires owners to know the condition of asbestos in their buildings and if tenants and/or employees are being exposed. If you are planning a renovation or demolition, EPA regulations under National Emission Standards for Hazardous Air Pollutants (NESHAPS), 40 CFR 61, Part M require you to know the extent of asbestos in your building prior to the start of work. With our experience, we know where to look. We will crawl through and sample the suspect materials in your building, assess their condition and quantify the extent of the problem. When complete we deliver CAD drawings showing the sample locations, extent of ACM found, and any damaged areas. We will make recommendations on how to handle the materials and provide you with a rough order of magnitude cost estimate for any recommended repairs or removals. Asbestos abatement contractors violating construction standards and regulations can expose you and your company to civil and criminal liabilities. The fiscal risks include: penalties and fines from regulatory agencies, lawsuits from building workers or tenants, and damages to your real property. When All Phase Environmental performs construction monitoring and air sampling services, we will protect your interests by having trained and certified professionals on site at all times during the asbestos abatement process. We can also measure the fiber concentration during removal projects and insure your building is always safe to be occupied by your staff or the public. An All Phase Environmental, Inc. employee will observe and document compliance with relevant regulations and standards and note the protective measures taken to isolate the work area from the occupants. We will provide on-site direction to correct problems and prevent the illegal removal of ACM. We will take OSHA personnel samples and area air samples to insure the fiber concentration levels are not exposing the contractor’s employees to asbestos fibers. We will also sample outside the asbestos removal area to insure your building occupants are not exposed to elevated levels of airborne asbestos fibers. Our personnel will conduct visual inspections and air sampling to provide you with final project clearance documentation. Construction monitoring and air sampling records are important legal documents illustrating your responsible actions and protecting you from future liability. Our specialists are licensed in several states, including California. They are also certified Asbestos Abatement Supervisors and National Institute of Safety and Health (NIOSH 582) certified. Do you have asbestos in your building? If the answer is yes, then you MUST give the employees in the building, who work with or may disturb asbestos, the proper training. OSHA regulations require your maintenance and janitorial workers to take a two (2) hour asbestos awareness class. All Phase Environmental Inc. can provide this training. Classes are taught by experienced and dynamic individuals who will focus on your specific building's Survey or O&M Plan and also cover safe work practices. We have tailored our curriculum to reduce anxiety that may occur from having ACM in your building.